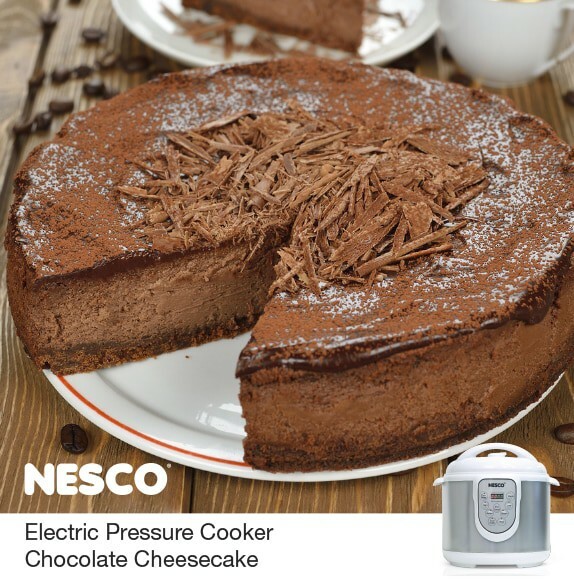 Creamy Chocolate Cheesecake is made simple with your versatile 6 Quart Pressure Cooker from NESCO®. Chocolate wafer cookie crumbs make every bite of this recipe extra chocolaty good. Mix 1 cup cookie crumbs and butter together. Press in bottom of 7″ spring form pan. Set aside. piece of aluminum foil and fold in half, lengthwise. This helps to remove pan after cooking cycle is complete. Place spring form pan on foil and lower into Nesco® Pressure cooker. Cover and lock lid in place. Turn regulator knob to SEAL. Program for HIGH pressure and cook for 20 minutes. Release pressure by using the quick release method. Unlock and open lid. Remove cheesecake from pressure cooker by lifting up the ends of foil. Let cool to room temperature before refrigerating. For best results, refrigerate overnight.